You are currently browsing the The Pet Product Guru blog archives for the day Sunday, April 14th, 2019. If you have an older cat and she ignores you when you call her, she may not just being stubborn, she may not have heard you. As with humans, hearing in cat decreases gradually with age. Cats can compensate so well that their owners may not realize that there is a problem until the cat is completely deaf. Look for disorientation, loud meowing and a startled response when touched from behind. Hearing loss due to aging can’t be cured, but deaf cats can still sense vibration. Tap your fingers next to your cat before stroking him to alert him to your presence. Never let a hearing impaired cat outdoors. Ear mites, infections and tumors can also impair hearing. 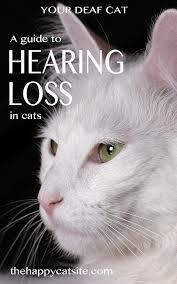 If you suspect hearing loss in your cat, check with your veterinarian.